Download this case study on the AMA’s use of F5 BIG-IP LTM and BIG-IP ASM and find out how you might be able to use the cloud to increase agility in your organization while remaining highly-available and secure. 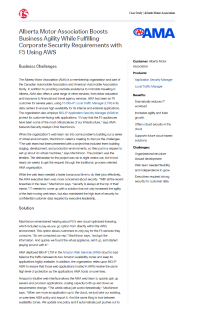 When the Alberta Motor Association found itself unable to build out virtual environments in the timeline required while meeting security needs, it turned to the cloud. By using F5’s cloud-optimized licensing within the Amazon Web Services environment, as well as its BIG-IP Local Traffic Manager and BIG-IP Application Security Manager, the company was able to reduce IT workloads, boost agility, deliver robust security in the cloud and support future cloud initiatives.